Medical products, such as implants, instruments and aids, not only need to be sterile, they also have to be free of residues from production processes. The necessary cleanliness can be achieved reliably, reproducibly and cost-effectively with the quattroClean snow-jet cleaning system, despite some products having complex geometries. In addition, the dry and environmentally-neutral cleaning technology is highly compact, easy to automate and simple to integrate into production lines and cleanrooms. Regardless of whether it is implants, surgical instruments for keyhole or conventional surgery, or many other medical products, residues from production processes pose a risk to the patient, even if they have been sterilised together with the product. In recent years, it has become increasingly important to remove dirt from manufactured parts, such as process media, separating agents, particles, tiny burrs and dust. On the one hand, high levels of cleanliness and biological compatibility are required; on the other hand, neither the surfaces nor properties of the products may be impaired by the cleaning process. 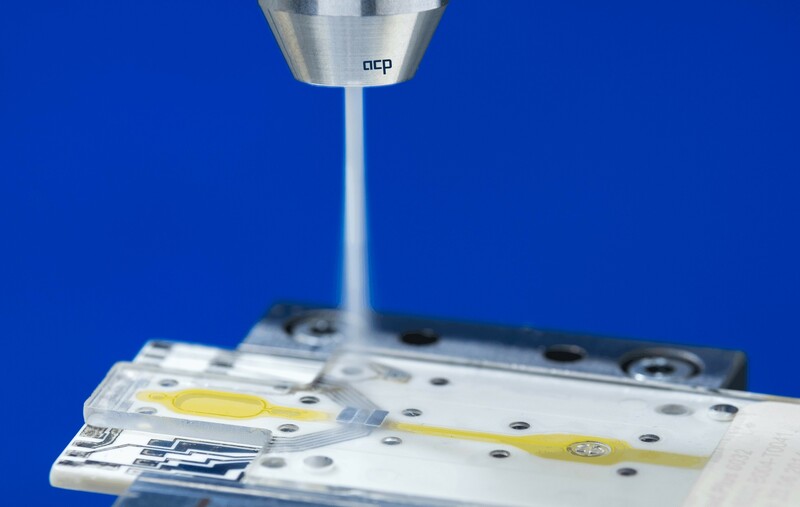 The classical wet-chemical final cleaning step with aqueous media often has its limitations - particularly if parts have complex geometries, such as blind holes, or complex contours or structures. This is where the quattroClean snow-jet cleaning technology from acp – advanced clean production GmbH opens up completely new perspectives in the medical industry. The cleaning medium used in this environmentally-neutral technology is liquid carbon dioxide, which is gained as a by-product from chemical processes, as well as from energy generation from biomass. Liquid CO2 is guided through the non-wearing two-component ring nozzle of the acp system and expands on exiting to form fine CO2 crystals. These are then bundled by a circular jacketed jet of compressed air and accelerated to supersonic speed. The patented technology ensures a uniform cleaning effect - even on large surfaces where several nozzles are used. The jet of snow and compressed air has a temperature of minus 78.5°C and can be focused exactly where it is needed. When it impacts on the surface to be cleaned, a combination of thermal, mechanical, sublimation and solvent effects take place. These four cleaning mechanisms enable the quattroClean system to reliably and reproducibly remove filmic contamination, for example residues of cooling lubricants, process oils, polishing pastes, separating agents and silicons, as well as dirt, such as chips, dust and tiny burrs. The low temperature of the CO2 snow jet also makes the cleaning process bacteriostatic, thus helping to reduce surface germ counts. Due to the fact that the cleaning step using non-combustible, non-corrosive and non-toxic CO2 snow is also gentle on materials, even delicate and finely-structured surfaces can be treated - either the entire surface or just a specific area as required. The aerodynamic force of the jet transports detached dirt away from the product and is then extracted from the cleaning cell together with the gaseous sublimated CO2. Since the workpieces are dry on completion of the cleaning process, they can be further processed or sterilised/packaged immediately. Due to the fact that the quattroClean snow-jet technology is capable of cleaning a wide range of medical products with complex geometries extremely thoroughly, it can be used for various purposes. As an example, the system has been used in series as a final cleaning step for titanium pedicle screws for some years now. The quattroClean system has also proven its worth as a final cleaning process for metal and plastic endoscope components. Excellent cleanliness results are attained even in extremely narrow tube cross-sections and blind holes. Such results are impossible – or only possible at high cost - with standard wet-chemical cleaning technologies because these areas cannot be rinsed well enough. A further domain of the quattroClean snow-jet technology is micro-deburring and finely cleaning plastic disposable systems for diagnostics, pharmaceutics, analytics and medical products. One example of these so-called disposables is microfluidic systems, such as lab-on-chip products, for the quick and easy analysis of human and animal body fluids. Micro-deburring and fine cleaning is also an issue if the cleaning system is used in conjunction with innovative drug carriers. These are manufactured from a special 3-D film containing pylon-shaped chambers functioning as drug reservoirs to deliver drugs via the skin. The quattroClean system can also be implemented to simultaneously lubricate, cool and clean machined implants and medical components made from PEEK. Besides increasing productivity by over a third, this keeps parts significantly cleaner, with the result that in some cases a final cleaning step can be done away with completely. 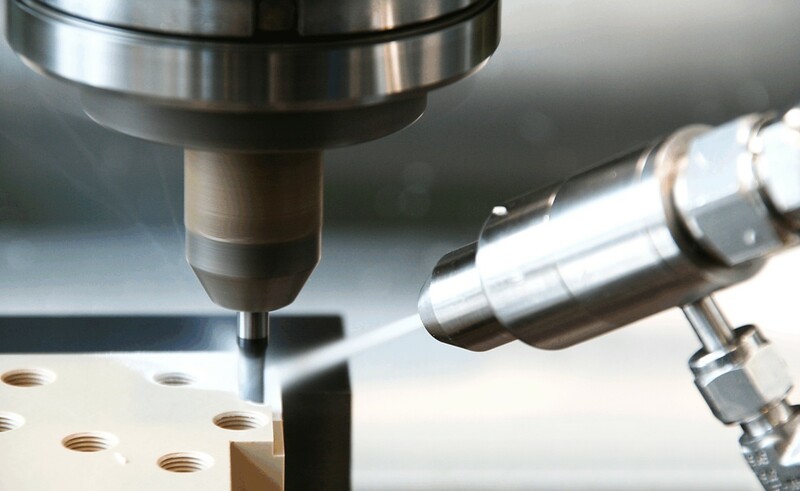 To satisfy requirements, a cleaning module can be integrated quickly and efficiently downstream of the machining process. The highly-efficient cleaning effect of the innovative cleaning technology has also been proven via a test conducted by The Natural and Medical Sciences Institute NMI at the University of Tübingen in Germany. 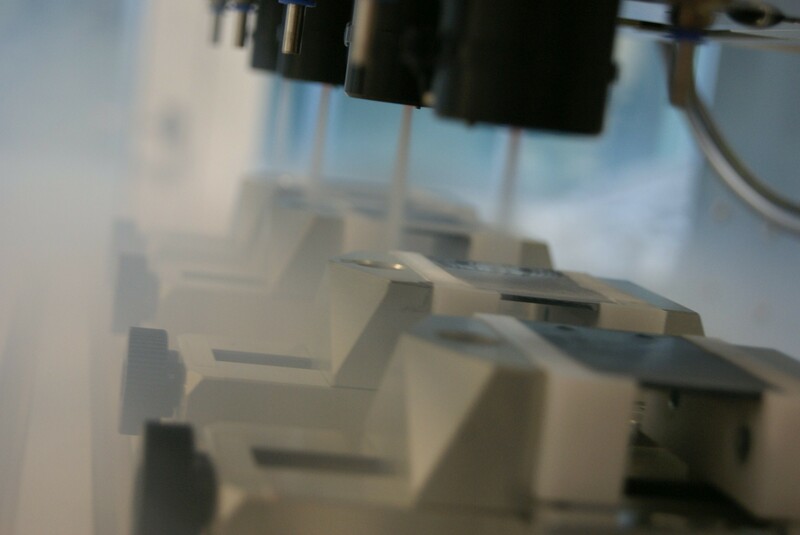 The final assessment of cleanliness, low particle concentration, cytotoxicity via a BCA test and functionality (surface structure) showed that the combination of wet-chemical with subsequent CO2 snow-jet cleaning using the quattroClean system achieved the best results on all of the metal samples. Thanks to its modular concept, the quattroClean system from acp can be easily tailored to customer demands and has a very small footprint. This enables manual, partially-automated and fully-automated cleaning systems to be realised and integrated into existing production, assembly and packaging lines. Cleaning tests are conducted at the acp technical centre to accurately determine all the process parameters for the application concerned, such as the volume flows for compressed air and carbon dioxide, as well as the duration of the jet. Material properties and the type of dirt to be cleaned off are also taken into consideration. Depending on the task at hand, systems for cleanroom use can be designed with their own local cleanroom system (MENV) including a specially-adapted extraction system.